Eerie how shadows can seem to crawl toward one and follow one’s every move; never leaving their side. Constantly, they watch as those in the light walk about ever so freely. Caution is advised if you find one acting strangely, one of two beings you could have on your hand. This time around we will talk about the option of it being the dragon species known as the Yilong. These creatures have the ability to make shadows move at their will; sometimes forming solid constructs or simply melting into the darkness. They are extremely crafty, able to plan several steps ahead of time while favoring surprise attacks. Usually, these dragons are hired for assassinations by other lands; rarely getting into larger conflicts except for warring with their human ninja neighbors in the land of Ying. The reason being not of land division, but a rivalry of gaining contracts for assassination targets. In appearance, these dragons unlike others have a beak-like mouth and are smaller in size. This proving an advantage as it helps them to move about quicker and with more acrobatic ability. Their smaller wings are more meant for gliding from roof top to roof top than anything else; depending on their quick feet or hitching a ride in a stranger’s shadow. Found along their body are thin black scales that help camouflage them into the darkness except for a band-like gray pattern found around the eyes to the back of the head. Down their spine you will find no spikes, only a smooth back to their short tail that they use to heighten their jumps. 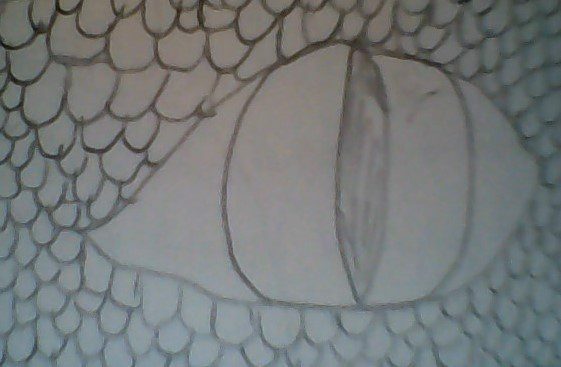 Their eyes adjust to light from having them be completely black to a sliver with green outside the pupil. Never try to face these creatures without a plan of action. Odds are they have already put theirs into effect before you take your first step. A sub species of unicorn, the Corniasp is a stone horse with a single diamond horn on its head. Unlike other creatures of rock, its hide contains traces of diamonds that it can use to dust the field through its nostrils. Almost nothing can stop this beast once it decides to charge. Its horn will pierce through anything that happens to cross its path; finishing the job by embedding its diamond hooves into the ground. Riding this creature is strongly advised against for it has only been domesticated by Stonewall and his men. Meeting a wild one is even more dangerous especially if it is the leader of its team. It will stop at nothing to ensure its fellow creatures remain unharmed by outsiders. Why the hybrid title? Sorcerers are not just limited to humans, although they are by far the most common found among the ranks in Mendaxum. There are other being that use magic, such as leprechauns, who decide to expand their knowledge by attending the schools at the magical land. Usually, this is accompanied by having to serve in the armies during their stay, unless diplomatic deals are struck. Most of the time the classes of Mendaxum do not have much diversity due to past history and the rule of Delsey. Their are several types of sorcerers found within the world of Magitotum. In the Mendaxum schools they teach and discuss teachings from the following types; Shamans, Mages, Summoners, Pyromancers, Necromancers, Magicians, the Pellax Core, and Tecuprin. Of course creatures like elves have different spells that are specific to their kind. Those teachings are left to their own kin, the knowledge sometime lost. Luckily, they might just find this lost magic within the contents of Mendaxum’s many libraries. Wisdom is considered the highest value among the ranks of sorcerers. So why include Species Spotlight? Sorcerers are actually a sub species found among the all species but are especially different in humans. These beings live longer than their counter parts due to their magic. As discussed before, to use their power one must contain a magical network. This keeps their body in better shape with stronger supporting cells; resisting the wear and tear of years gone by. One must be born with this system in order to become a sorcerer of Mendaxum, at least that was the original thought. Merlin, the genius that he was, broke this idea. He found a way of bestowing regular humans with a magical system. An astonishing feat when he helped Arthur by strengthening his army; giving each of the Knights of the Round Table the ability to perform magic. It is scary to think that Delsey could do the very same if she chose to do so. A trickster by nature, this creature relies on magic to defend itself though that may not be the right word. Leprechauns are usually total cowards, only getting physical during a bar brawl with their kin. As much as they avoid fighting, it does not mean they recoil from conflict. Most of these creatures gain their vast wealth by tricking other creatures out of their money. Their magic revolves around teleportation, shape shifting, and misdirection; allowing for the leprechaun to prevent their capture. If this unfortunate event occurs, they are either required to give up their pot of gold or grant one wish. This is considered the most embarrassing of circumstances that can happen to one of their own. When not swindling people from their money, they have a talented and honest gift of shoe making. To wear a shoe made by these creatures is to wear a soft blanket that hugs the soles. Don’t let the outside fool your for their craftsmanship shall last a lifetime and never be scuffed. To acquire such fine work, one must find their hidden village found on the island of Eire. It is said that no other creature other than the leprechaun has seen this village. A leprechaun’s attire consists of a green overcoat with long coat tails with matching slacks while they only stand three feet tall. A white shirt is worn underneath with a similar green west with gold trimmings in the design of usually a shamrock. If one of them wants to show off their wealth, they will even wear a vest of complete gold. In appearance, they have red hair with some freckles that decorate their skin. A beard decorates the face of most males on this species. Upon their head can rest three different types of hats; a top hat, bowler hat, or paddy cap each with decorations of clovers. Speaking of which, when one of these creatures dies, the place at which their body lies becomes a bed of shamrocks. A peaceful end for this creature of mischief, but an appropriate one. Look to the sky as lighting strikes and thunder crashes. In between flashes you might just see a Vibray. A species of dragon that can manipulate lightning; these creatures are feared upon the battlefield. The bottom half of these dragons buzz, crack, and pop from the electricity that replaces its lower appendages and tail. This prove to be better for their alignment of that perfect shot. To help them focus, they fold their wings around their heads like a hood. Zigzag patterns of yellow and blue decorate their thin metallic-like scales. From their backs, spikes arise that are used to absorb the electricity in the air. Their home is found in the great tower of Relampago found in the the ocean of Moana. Constant storms surround this place as lightning strikes over and over at the titanic building made of silver, copper, gold, and aluminum. This electricity is used to power the entirety of their civilization. Unlike most dragons, they prefer to strike from a distance. A common attack method for this species is to form a bow of lightning and shoot bolts with scary accuracy. Don’t think hiding from this dragon will work either. It can see the electrical pulses of a creatures nervous system even through a storm, which is not uncommon. Much like the Kikorangi, a storm appears once this creatures decides to go all out. Another word of caution is to not underestimate this creature. Although they prefer to fight at a distance, this does not mean they are inadequate at fighting in close combat. A single touch from this dragon could kill a man from the electricity that runs through its veins. This is impart to the trace amounts of mercury found in their blood that naturally lets electricity flow. Make sure you take the necessary precautions before even thinking of battling this foe. Deep below the great ocean of Moana dwell the Kikorangi. These creatures have fish-like scales, webbed hands and feet, gills, webbed spikes along their spines, dorsal fins, and tail fins to make them quickest being in the water. No other creature can swim faster than a Kikorangi, even though many will try. Out of the water, they are able to still breathe the air around them and use the wings that they keep folded against their body to fly. A spurt of water from these dragons’ mouths can rip the very skin away from any creature. Their powers can even cause storms that can turn the ocean into a roaring monster; devouring all that dare approach it. It is common for this dragon to be surrounded by rain while on land. If so, watch out for any droplets. With a flick of their wrist, those harmless drops can feel like a barrage of rubber bullets. Upon an island surrounded by volcanoes and known as Kebakaran live the beings who wield the hottest fire in all of Magitotum, the fearsome Matahari. A challenge to face in combat, their powers range from fire breath, fire enforcement, heat resistance, infrared vision, incredible strength, flight, and the more experience can even move lava. To top it all off, they are heavily guarded by the thick red scales that decorate their hide. Their look is much like the idea of a traditional dragon; great wings upon their backs and claws that can cut through rock. Most have horns upon their heads and spikes down their backs and out their tales. When in battle, it is common for the Matahari to stand on their two feet with a sword in hand alight with fire. Their swordsmanship can even give the Knights of the Round Table a challenge. Their fiery assaults are too much for many to handle but do not let that deceive you. They have a high code of honor that they follow to the letter. Respect must be earned by battle and nothing less, except if one is a child, a woman with child, injured, or elderly. Be sure to show the proper respect when meeting these creatures.